It really is the year of extremes on the weather front. We went from months and months of rain to a drought in the space of weeks. The dry arid spell was very welcome in the beginning, but as it has continued many throughout the country wish it would disappear, even for just a short time. A small amount of rain came last week; perhaps larger downpours are needed to balance the ground moisture deficit. Hopefully farmers will get an opportunity to take more silage this year to stock up for the winter. Here, on our sheep enterprise, the drought hasn’t affected the whole farm. Areas with sandy shallow soil along Lough Mask were burning up and the newly reseeded ground was also in need of water. Grass was beginning to become tighter on the farm, but compared to the south and east we got away lighter. The Typhon that I sowed should hopefully push on now with a bit of rain and should be ideal for when I wean lambs in the next few weeks. We had a glorious day at Sheep 2018 in Athenry. It was very well organised and laid out by Teagasc and their staff and it was great to see such enthusiasm in the sheep sector. There were many informative areas with the latest research and many workshops on grass management, breeding etc. There was also a great effort put in by the breed societies to help make the event a success. It was a busy day for our flock as we showed sheep with the Mayo Mule & Greyface Group, Bluefaced Leicester Society, and the West of Ireland Lanark breeders. There was good interest in the sheep on the day and we were delighted to take home some prizes on the day too. The standard of sheep was top notch and continues to improve year on year. Our next outing will be at our local Tourmakeady Agricultural Show and then on to the Tullamore Show in August. All the lambs on the farm received a multi trace element and vitamin dose pre-weaning. It is one of the options I took with the Sheep Welfare Scheme to supplement with minerals pre-weaning. 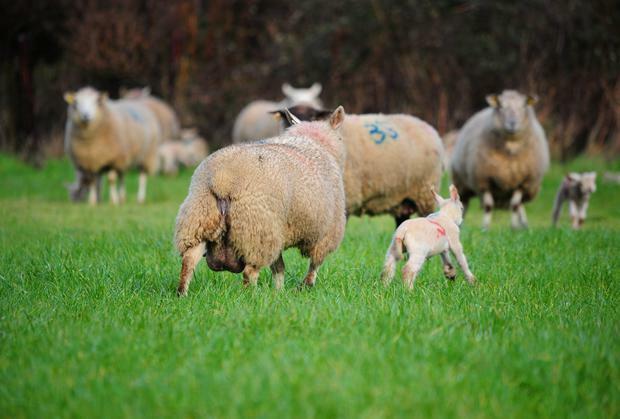 Lambs tend to always respond well to mineral supplementation as the ground on our farm is deficient in all trace elements. I would supplement the lambs regardless even if it wasn’t an option for the Sheep Welfare Scheme. I’m quite happy with the way lambs are thriving considering the tough year. Lambs will be weaned this month and the Typhon will host many of the stronger wether lambs which I hope to finish off the crop alone without meal. It will be interesting to see how they will grow and thrive. Once weaned, any ewes that were ear marked due to an issue at lambing time will be pulled together for culling. After they have dried up, they will be put on some better grass and sold with better condition on them to the factory. Ewes that have poorer lambs at weaning will also be pulled into a different group. I will assess the reason for their lambs not growing that well and then make a decision on them. The Lanark type Blackface ewe lambs that grew well and are healthy will be kept as replacements on the farm. It’s the first year in a long time that I have quite a few Lanark type ewe lambs to choose from as replacements as I often bought in all of my replacements. The decision was made last year to focus on breeding more of my own replacements with perhaps some lots bought in on occasion.